Although perfusionists, formerly known as cardiovascular perfusionists, are not well known to the general public, they play a crucial role in the field of cardiovascular surgery. They operate what is known as the “heart-lung machine.” The perfusionist is responsible for all aspects of the heart-lung machine whenever it becomes necessary to interrupt or replace the functioning of the heart by circulating blood outside of a patient’s body. There are approximately 3,200 perfusionists employed in the United States. When open-heart surgery began in 1953, surgeons found it was virtually impossible to operate on the heart while at the same time expecting the heart to maintain its normal func­tions. Heart-lung machines were developed to circulate the patient’s blood outside the body and to main­tain certain body temperatures dur­ing surgery. These machines solved the problem of maintaining stable bodily functions during the opera­tion so that the heart could resume its normal functioning following the operation. Those who operated the early heart-lung machines were not specifically trained for this sub-specialty but, rather, came from the ranks of respiratory therapists, oper­ating room technologists, biomedical and laboratory technologists, and nurses. These early heart-lung machine operators were often called pump technicians, perfusion techni­cians, extracorporeal technologists, and extracorporeal perfusionists. From the mid-1950s until 1968, perfusionists were trained primar­ily by apprenticing under existing practitioners. In 1968, the Ameri­can Society of Extracorporeal Technology (AmSECT) instituted a program of perfusionists’ certi­fication that the American Medi­cal Association recognized with formal status in the 1970s. Also at this time, the American Board of Cardiovascular Perfusion (ABCP) was established. In 1980, the ABCP established formal requirements for the education and accreditation of perfusionists. Reflecting the increased sophistication and specializa­tion of open-heart surgery, perfusionism has grown more complex. The job of the perfusionist now includes put­ting together and operating the heart-lung machine, the artificial heart, blood transfusion devices, the intra-aortic balloon pump, and various ventricular-assist devices. Perfusionists perform one of the most delicate and crucial services for patients during open-heart surgery, coronary bypass, or any other procedure that involves the heart or the lungs. The perfusionist operates equipment that liter­ally takes over the functioning of the patient’s heart and lungs during surgery. Such equipment may also be used in emergency cases of respiratory failure. When surgeons pierce the patient’s breast bone and the envelope surrounding the heart, which is known as the pericardial sac, they must transfer the functions of the patient’s heart and lungs to the heart-lung machine before any surgery can begin on the heart itself. This process is known as estab­lishing extracorporeal bypass, or outside heart and lung func­tions. The heart-lung machine is activated by inserting two tubes into the heart, one circulates blood from the heart to the machine and the other circulates blood from the machine back into the heart. It is necessary during this procedure not only to maintain circulation and pumping action but also to maintain the appropriate oxygen, carbon dioxide, and other blood gas levels. In addition, perfusionists must effectively control the body temperature of patients who are undergoing extracorporeal bypass circulation because the flow of blood through the body greatly influences body temperature. To slow metabolism and reduce the stress on the heart and other bodily systems, perfusionists often reduce the body temper­ature of patients during open-heart surgery to 70 degrees Fahrenheit or below. Perfusionists use various probes within the body to monitor body temperature, blood gases, kidney functioning, electrolytes, and blood pressure. 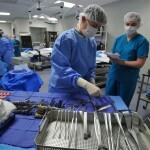 Although the ultimate responsibility for open-heart sur­gery and for decisions concerning blood circulation, tem­perature, and other matters rests with the surgeon in charge of the operation, surgeons tend to rely heavily upon the judgment of perfusionists, who are regarded as specialists in their own right. Although the perfusionist may never have a discussion with the patient, perfusionists almost always have preoperative conferences with surgeons to discuss the patient’s condition and other characteristics, the nature of the operation, and the equipment to be used. Because of the nature of their work, perfusionists work in hospitals in cardiac operating rooms. They are members of a cardiac surgery team, and it is not uncommon for per­fusionists to work through several successive operations in a row as well as to work on emergency cases. Because open-heart surgery cannot be performed without these specialists, perfusionists are usually on call a great deal of the time. High school students interested in perfusion technology should prepare by taking all available science, mathemat­ics, and health science courses. To work as a cardiovascular perfusionist requires formal training from one of 21 schools throughout the United States accredited by the Commission on Accreditation of Allied Health Education Programs. As a prerequisite to admission, these schools generally require a bachelor of sci­ence degree, although in some cases they accept applicants who have trained at nursing schools and other technical schools and have experience as nurses or health technicians. Accredited perfusion technology programs range in length from 20 to 24 months. Several accredited schools offer a combined undergraduate degree and a degree in perfusion technology, but more often perfusionists are trained once they have completed a bachelor’s degree or other training. There is strong competition for entry to an accredited perfusion technology program; only 10 to 20 percent of applicants are accepted. The accredited schools carefully examine academic record, character, and even personal temperament before accepting new students. The admis­sions officers at these schools realize that it takes a special individual to function under the kind of pressure and long hours perfusionists frequently encounter. A strong background in biology, mathematics, and other sciences is recommended for applicants to perfusion technology programs as these programs are designed to convey a great deal of technical information as well as clini­cal training over a 20- to 24-month period. The perfusion technology program includes courses in physiology, cardi­ology, respiratory therapy, pharmacology, and heart surgery. Classroom experience is combined with extensive clinical experience where students learn about extracorporeal cir­culation, respiratory therapy, general surgical procedures, anesthesia, and other operating room procedures. Nearly all of the accredited perfusion technology programs attempt to involve students as early and as much as possible in clini­cal experience, as the practice of extracorporeal circulation relies so much upon actual operating room experience. Certification currently is not an absolute requirement for perfusionists. But it is rapidly becoming a practical requirement as more than 70 percent of perfusionists nationally are now certified. Certification is administered by the American Board of Cardiovascular Perfusion. Applicants must meet educational and experience requirements and pass a certification examination, which consists of two separate parts: the Perfusion Basic Science Examination and the Clinical Applications in Perfusion Examination. Applicants who successfully complete these requirements may use the designation, certified clinical perfusionist. To be eligible for recertification, you must perform at least 40 clinical perfusions per year and complete con­tinuing education programs. At present, perfusionists do not need separate state licenses to practice. You must be able to react quickly in emergency situations and keep a cool head. Occasionally, medical situations occur in which all the combined effort and talent of the surgical team are unable to help the patient. You must have strength of character to accept the limitations of modern medicine, as well as its successes. As with any technical medical field, one of the best ways to learn about the work of perfusionists is to talk with an existing practitioner. All hospitals performing open-heart surgery have perfusionists on staff who may be available for interviews with students. AmSECT offers a list of accredited perfusion technology programs, and you may be able to talk to the professors, instructors, and admissions officers in those respective schools. Roughly half of the approximately 3,200 perfusionists in the United States are directly employed by hospitals, and the other half are independent contractors or practitio­ners who make themselves available by contract to one or more hospitals. Independent contractors are responsible for their own business affairs including medical health insurance, uniforms, liability insurance, and other items. The most important prerequisite for entering the field of perfusion technology is acceptance at an accredited school that offers such a program. Once you have entered a pro­gram you should begin to investigate the field first through their professors and teachers and then through AmSECT. This professional society of perfusion technologists has an active student membership division that hosts meetings and conferences and is a good source of advice and infor­mation concerning various job openings in the field. Because there are relatively few perfusionists nationwide and the field of extracorporeal technology (open-heart surgery) is growing, perfusionists have advancement opportunities in terms of both higher salaries and the opportunities to perform more complicated work. How­ever, the field of perfusion technology is so specialized and so small that the concept of advancement is related more to a perfusionist improving his or her technical skills through experience than to administering large departments or large numbers of people. Qualified perfusionists, however, can advance into management or to the technological side of the field. The practicing perfusionist advances through gaining higher pay, better working conditions, and the ability to be involved in more complicated procedures as well as to train less-experienced perfusionists. Perfusionists may also obtain teaching positions in one of the accredited schools or conduct research funded by educational institu­tions, foundations, or professional societies. Salaries for perfusionists compare favorably with those of other health technicians. According to a survey by Salary.com, the median annual salary for cardio-pulmonary perfusionists nationwide was $97,671 in 2006. The lowest paid earned $88,938 or less per year, while the highest paid earned more than $107,313. A report by Drexel Univer­sity found that the average starting salary for graduates of its perfusionist program was $55,000. According to the American Society of ExtraCorporeal Technology, the aver­age salary for a new graduate is about $50,000 per year. A certified perfusionist with 2-5 years of experience earns $55,000 to $69,000 annually. Salaries range from $65,000 to $72,000 for those with five to ten years of experience. Perfusionists usually receive a standard benefits pack­age that includes paid vacation and holidays, insurance, and 401(k) plan options. 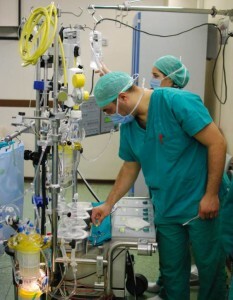 Perfusionists typically work in operating rooms of hos­pitals. They work alongside the operating table as part of the surgical team; it is the responsibility of the perfusionist to see that the equipment is properly assembled and maintained at all times. Perfusionists frequently must spend long hours in oper­ating rooms, often under stressful conditions. Although most perfusionists average 125 procedures a year, some of these procedures can be quite lengthy, and they may occur at odd hours as well as under emergency conditions. The job outlook for perfusionists is good. Employment is expected to grow at a rate that is about as fast as the average through 2014. The number of Americans age 65 and over continues to rise. This demographic group is at a higher risk for developing cardiovascular disease, therefore requiring the professional expertise of perfusionists. A number of factors may limit growth in this field. Open-heart surgery is very complex and many hospitals are not capable of performing such procedures; they are usually performed only in medical centers with 300 or more beds. Second, many hospitals have tried to cut costs by reducing the number of new perfusionist hires and asking perfusionists to take on more procedures without additional compensation. Finally, the development of new medical techniques, specifi­cally ones that do not require the use of a heart-lung machine during surgery, may limit the need for these workers.